When it was time to start packing up our belongings for the move, I had to break it to my son that he couldn't take his 20lbs. of rocks from his rock collection to Utah with us. Here is just a portion of his collection (also displayed for sale, for the right price). He was honestly pretty heartbroken about it, which means I wanted to give in and let him sneak them in the bottom of a box. But then I had a better idea. 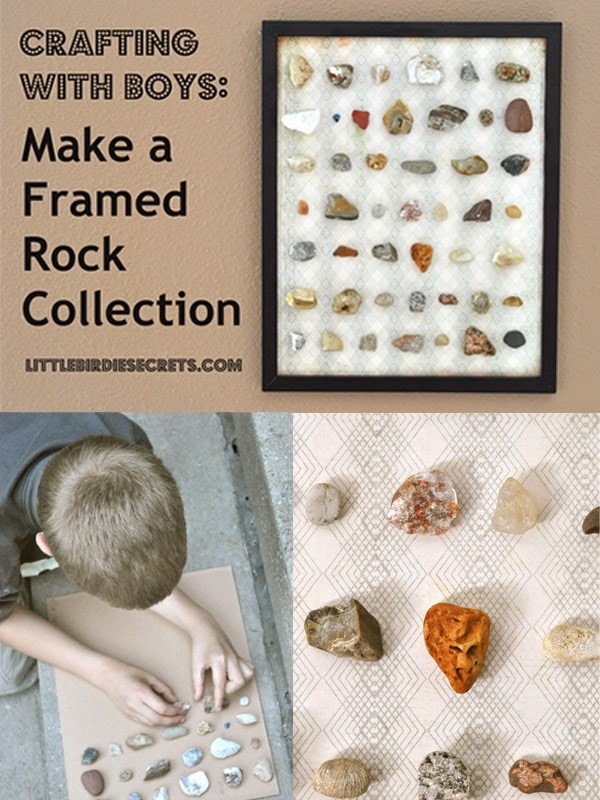 Why not let him pick out his very favorite rocks and make a framed collection that he could actually display in his new room? Plus, this gave me a chance to craft with my boys, which they are less and less interested in these days. Bonus. 1. 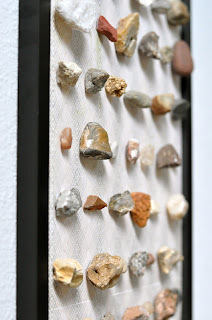 After thoroughly cleaning your rocks, have the rock collector line up rocks the way they want them to be in the frame. 2. If you have a piece of cardboard in the back of your frame, use this for your base. If not, cut a piece to fit your frame. Then cover the cardboard with patterned paper (I had to overlap two pieces to make it big enough). 3. 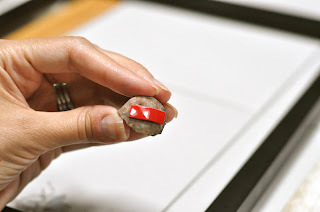 Cut a small piece of mounting tape and adhere it to the back of each rock. 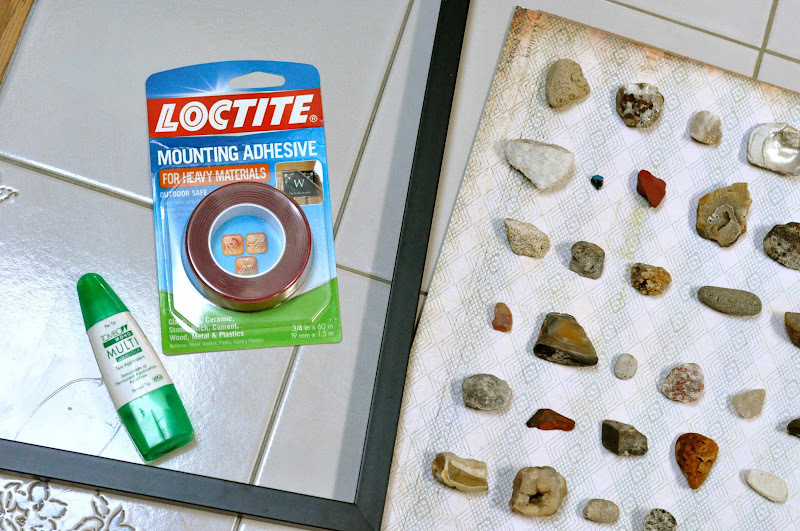 Peel off the backing and stick it carefully in place (with the Loctite tape, you do not have a chance to reposition, so be sure you put it where you want it!). 4. 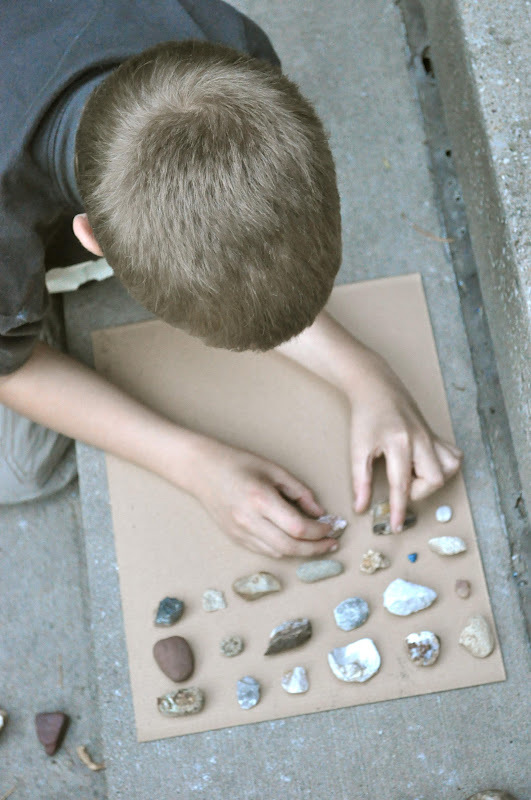 Continue with all rocks until your cardboard is full. Place the cardboard in the frame and replace the backing. Hang! 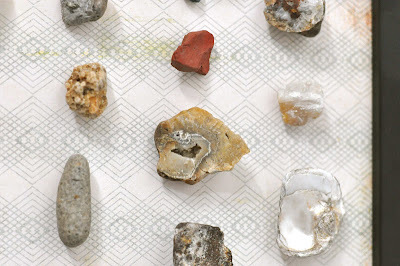 Here are some of my son's favorite rocks. 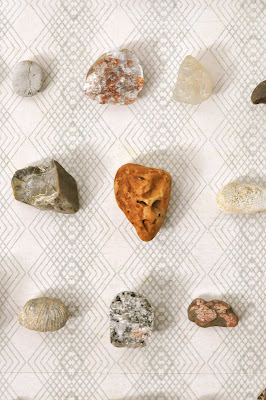 He really has an eye for cool rocks! I love that we'll be able to hang this in his new room to remind him of our time in Iowa, as well as display some of his amazing finds. And we had a great time making it together! This is a great summertime craft to do with boys (girls, too!). Pin it now to pull out when your kids get bored this summer! And follow my Summertime Fun board on Pinterest for more crafts and activities! What an awesome idea! And it looks so very nice. 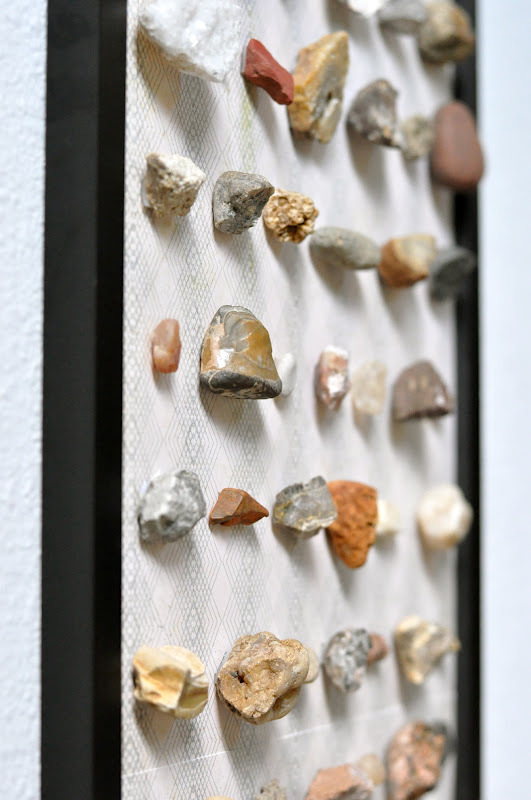 Your son must have had some great rocks! I know how hard it must have been to select those most precious ones. I have a husband that is 55 and I think that if he had to make that choice, he just wouldn't move! ;) Your son is very brave!!! That is very awesome. Ah, boys. My son likes to collect the wood chips from the playground at daycare. It is amazing what he decides is worthy of being put in his pockets to take home. That is cool. As a mom to two boys I can relate. 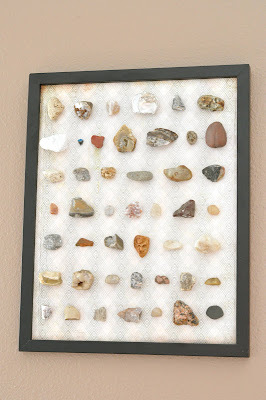 We actually moved an entire stick and rock collection twice. I adore this more than I can say!! 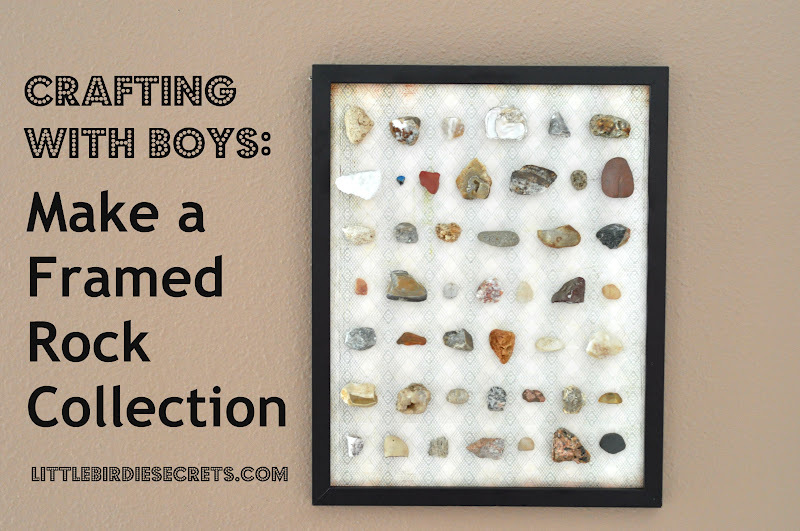 I have three boys with rock collections and we can't move them all the time and we move often so this will save me!!! Thanks !! Brilliant! You know I'm gonna borrow this idea for Quaid. What a wonderful idea - thanks so much for sharing. Our family has a small forum (just for family members) and since there are a lot of grandson's, I knew they'd be interested in this craft. I posted to them about it, left the link to your blog, as well as telling my daughters what else was available on your blog. I'm sure they'll be by to check it out. Thanks for such a wonderful blog, I've now bookmarked it - I'll be sure to come back and visit soon! This is a great idea, and I'd love to do this with my collection. However some of my rock samples are heavy (3-4 lbs?) and a bit larger than those pictured. Do you think the adhesive tape would be able to hold them in place? Thanks for your help!